LottoDay is decent enough, with a variety of games to keep you playing. LottoDay offers multi-draw discounts, good security measures, and zero commissions. You can play a variety of lottery games, with syndicates and a broad selection of scratch cards thrown in for good measure. The limited language options are a bit disappointing, especially for players who prefer sites they can use in their native language. Overall, though, LottoDay is an all right option if you’d like to try your hand at lotteries from around the globe. LottoDay is a lottery agent service that purchases lottery tickets on your behalf. They are operated by Phoenix Online Holdings Ltd., which is a company registered in the British Virgin Islands. They have offices in Gibraltar and India. Lottogroove is an online lottery agent. In fact, it’s the type of lottery agent that actually sends you a scan of your ticket, with the physical copy kept in a safe place in case you need it to redeem a prize. As a lottery agent, LottoDay works as a type of middleman: whenever you buy a ticket through the site, LottoDay sends out its agents to buy an official lottery ticket on your behalf. This means you’re an official participant for your chosen game, and any winnings will be paid out directly by the lottery operator. Solo play: You can buy individual tickets for your preferred draw. Group play: You can buy shares in a pre-bought batch of tickets. Like many lottery sites, LottoDay also lets you buy ahead for multiple draws. Creating a free LottoDay account is incredibly easy. No need to fill out lengthy registration forms here! LottoDay only asks for your email address, full name, mobile phone number, and preferred password. If you have a Facebook account, you can even use it to sign in and skip the registration form altogether. LottoDay automatically gives discounts if you go for multiple draws or if you purchase a subscription. For starters, if you buy tickets for 2 or 4 draws, you’ll get 5% or 10% off, respectively. Buying tickets for 8 draws gets you a 15% discount, while a subscription gives you 20% off. LottoDay offers some of the most popular lottery games, though other lottery agents have a larger selection. 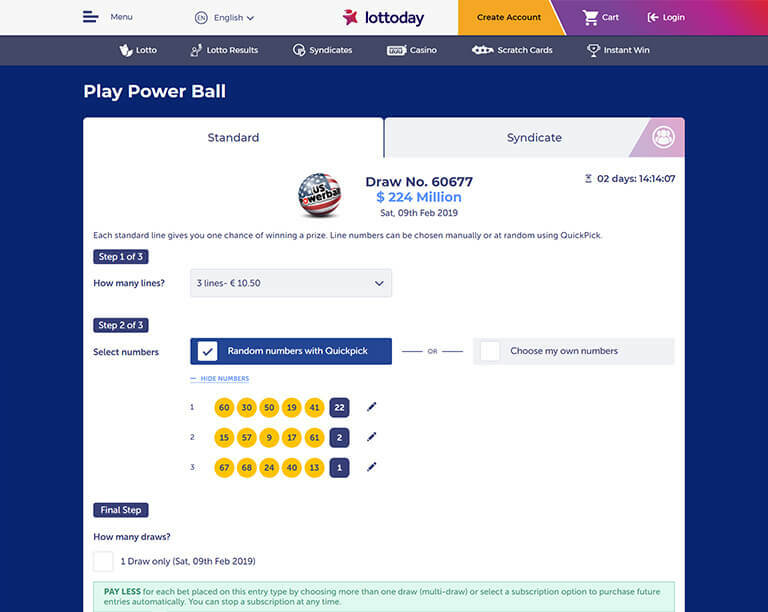 LottoDay lets you play popular lotteries like Powerball, Mega Millions, and Euromillions, LottoDay also offers EuroJackpot, UK Lotto, Australia Powerball, El Gordo, and Oz Lotto. The most disappointing fact here is that, up until recently, LottoDay used to offer up to 20 lottery games. What happened that they had to drastically cut down on their offerings is beyond me. What’s clear is that as far as game variety goes, LottoDay isn’t as reliable as it once was. LottoDay offers two major Powerball games. Aside from the massively popular US Powerball, you can also play Powerball Australia. While the latter doesn’t have the same massive jackpots as its US counterpart, it still boasts of large prizes — with the added bonus of having slightly more forgiving odds. A ticket with the minimum requirement of 3 lines costs €10.50. LottoDay reports results for all the lotteries it offers. Just drop by the LottoDay homepage to get up-to-date results for all the lotteries available to play. You can also check previous results or find out when the next draw will be held. LottoDay offers a full selection of virtual scratch cards. If you’re itching for an instant win, you can take a break from draw games and pick one of LottoDay’s virtual scratch cards instead. There are many games to choose from here, with a range of jackpots up for grabs. 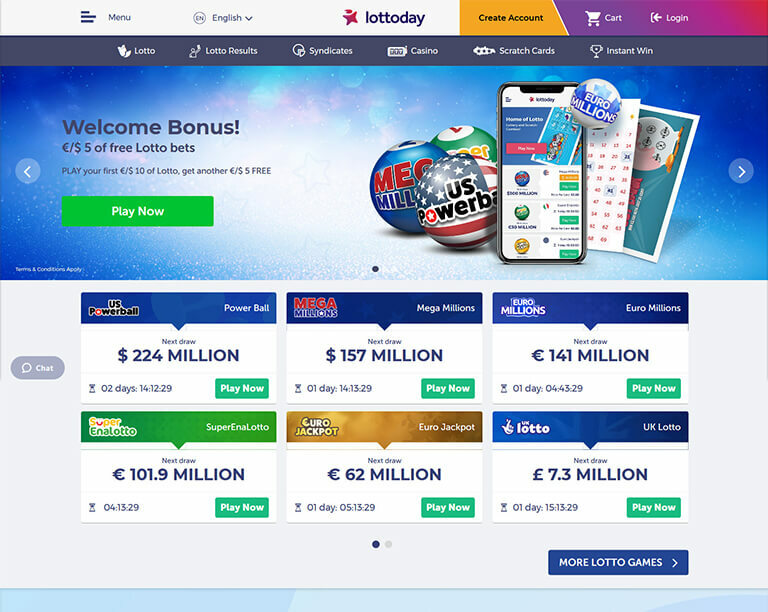 LottoDay offers syndicates for two of its biggest lottery games. Much like their regular lottery games, LottoDay’s syndicate offerings took a hit in terms of selection. Before, LottoDay used to offer group play options for Powerball, Mega Millions and SuperEnalotto. Now, however, your choices are down to the first two. Sure, for some people, the two most popular lotteries around are enough—but having more choices is always better. Then there’s the odd share ratio. Each of LottoDay’s syndicates contains 50 shares each – pretty standard stuff, right? Not quite. See, each player can purchase up to 50 shares, which means that you can own every share in each syndicate, at least in theory. This isn’t a common practice. Not at all. LottoDay is owned and operated by Phoenix Online Holdings Ltd., a registered company based in the British Virgin Islands. Yes, LottoDay is run by a real company with official registration in the British Virgin Islands. Yes — outstandingly so. LottoDay uses Digicert SSL encryption to protect your transaction details. Plus, LottoDay also complies with PCI DSS (or Payment Card Industry Data Security Standard) to ensure further protection for your financial transactions. Overall, I’d say LottoDay’s security measures are up to snuff. Is LottoDay a real or fake company? LottoDay is owned and operated by a real company, Phoenix Online Holdings Ltd., which is duly based and registered in the British Virgin Islands. How does LottoDay make money? LottoDay doesn’t charge commissions for your purchases. All of its revenue comes from handling fees that are already folded into the website’s ticket prices. Yes, LottoDay is legal, with its operations officially registered and, presumably, regularly inspected. Does Lottery Critic Trust LottoDay? Yes. LottoDay covers all the essentials to ensure transaction security, and then some. My only quibble here is that the information on the website itself can get confusing. For example, the LottoDay FAQs describes their SSL security as 128-bit encryption. Elsewhere on the site, though, LottoDay contradicts that by claiming to have 256-bit SSL encryption instead. Claiming your winnings at LottoDay is simple – but be prepared to travel if you win the jackpot. When you win, LottoDay will email you within 24 hours of the publication of the official results. You can also check your account on their website, as well as the results page, if you want. If you win the jackpot, on the other hand, LottoDay’s agents will email and call you to notify you of your big win. Prize claiming works much like most lottery sites: Prizes $600 or less will automatically be deposited to your account, while winnings that go beyond this threshold will have to be claimed in person. Another thing worth noting: LottoDay does not take commissions from winnings. LottoDay accepts several payment methods. One thing that confused me was that you could only deposit using Visa, MasterCard and NETeller; no other mention of Maestro or Entropay. They do, however, display those two payment methods’ logos on their website, which leads me to believe that LottoDay accepts them in some capacity. One thing you should note is that, when withdrawing, you need to make sure that it is in the same currency that you used when you deposited. Otherwise, you might run into problems. There’s also a minimum withdrawal of $20 (or whatever its equivalent is in another currency), so be sure you have enough funds before withdrawing anything. Has anyone won on LottoDay? LottoDay doesn’t offer any information on previous winners or payouts. I was impressed with LottoDay’s customer support options. You have lots of ways to get in touch with them. You can reach them via 4 toll-free lines, each for residents of UK, New Zealand, Canada and South Africa, every Monday to Friday, from 10am-7pm GMT. Alternatively, you can fill out a form or email them directly, if you want. Sadly, there’s no live chat option available. It certainly would’ve been the icing on the cake. Meanwhile, if you prefer sorting things out on your own, their FAQs are pretty hefty. You can learn just about everything, from purchasing tickets to payments and more. LottoDay looks, feels and functions just like any other lottery site – which is a good thing. If you’ve been to other lottery sites before, you’ll feel right at home here. The front page displays the latest lottery jackpots and results, along with a quick explanation of their process. Up top, you’ll find a menu where you can access the lottery games, syndicates, results page, and support center. Adding payment methods is equally easy, as are withdrawing money, viewing your transaction history and even adding promo codes. These are all organized neatly in your account. I also like that there isn’t a single advertisement on their website, which helps create a more pleasurable online lottery experience. One thing I didn’t like was how few LottoDay’s supported languages were. Aside from English, you could only switch between Russian, German, and Spanish. As such, people who aren’t fluent in any of the languages offered might have a difficult time using LottoDay’s website. Sure, you could funnel the website through Google Translate, but there’s no guarantee you’ll always get an accurate translation. Picking your numbers and purchasing tickets works just like in any other lottery site. If you’ve played in other lottery sites before, LottoDay’s process will immediately feel familiar. It’s at least worth a look, but there’s nothing here that you won’t find in other lottery sites. Overall, LottoDay is okay. They don’t take commissions from winnings, for starters. They also offer multi-draw discounts, and good security measures. However, those pros are sometimes overshadowed by small issues like limited language options. Again, LottoDay is a perfectly decent options – but there are better ones out there.